In this part of the Burdekin basin, Source Catchments modelling should represent upland gullies as eroding at approximately 50 per cent of their long-term average rate. This analysis is being further tested and extended to other sites in the Great Barrier Reef catchments. The Upper Burdekin catchment is the largest sediment source area within the Burdekin basin. Past erosion monitoring and sediment tracing in the Weany Creek catchment near Charters Towers shows that gully erosion is potentially an important source of fine sediment which can be washed into waterways and enter the Great Barrier Reef lagoon. However, erosion rates vary between different gullies and over time. Some gullies now have grass coverage in parts, suggesting they may have stabilised. CSIRO scientists, collaborating with the Queensland Government Department of Natural Resources and Mines and NQ Dry Tropics staff, used historical air photographs from 1945 to 2010 to compare the recent growth of 30 gullies across the Weany Creek catchment with the average growth rate over the entire life of the gullies. Gully activity is an important parameter in the Source Catchments modelling of sediment loads entering the Great Barrier Reef. Gully activity indicates how active gully networks have been in recent decades, which gives information on the importance of gully erosion relative to other sediment sources. 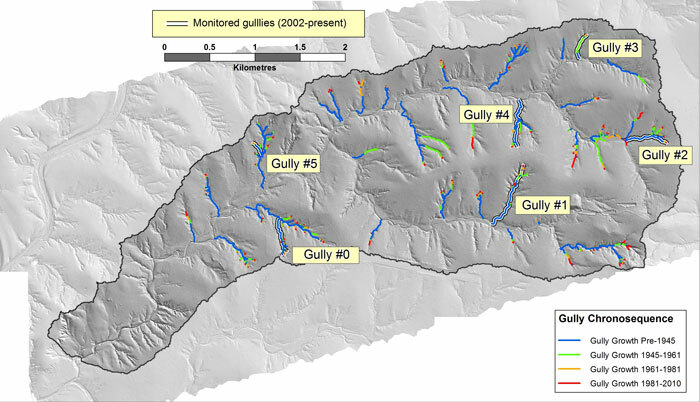 Detailed monitoring of six gullies showed that most erosion occurred at the gully headcuts rather than elsewhere in the gully. The headcut is the near-vertical change in elevation at the upslope end of the gully. The gullies tracked over time using air photographs were distributed across the catchment. Growth of gullies in the Weany Creek catchment between each aerial photograph measurement period. Gullies with additional on-ground monitoring are indicated with labels. The land surface image was derived from airborne laser scanning commissioned by the Paddock to Reef program. Since 1960, the rate of gully lengthening has slowed. 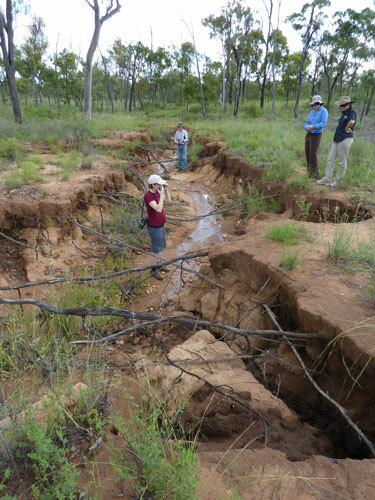 Since 1980, the gullies have been growing longer through headcut erosion at approximately half (0.46 times) the average growth rate since gully erosion commenced. This result assumes the average date of gully formation occurred at the junction with the main stream in 1900. Earlier gully formation is unlikely given the long-term decline in gully erosion rates generally observed after their initiation. Increase in length of measured gullies in the Weany Creek catchment from 1945 to 2010. 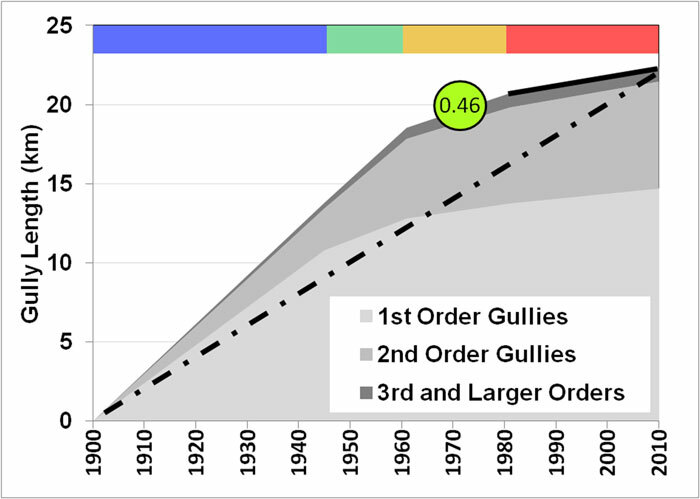 Number in green indicates the gully extension rate in the past 30 years as a proportion of the rate since gully commencement, assuming the year 1900 as the initiation of gullying in the catchment. First order gullies are those elements connected directly to the stream network, while second and third order gullies represent upstream ‘forks’. Active gully erosion in the Weany Creek catchment following a large wet season, April 2010. Photographer: Mark Silburn (Department of Natural Resources and Mines). The decline in gully erosion rates is caused by reduced runoff volume as the gully head progresses upslope and the catchment area supplying runoff becomes smaller. However, while gully erosion may have slowed in the long term, recent big wet seasons have seen erosion in all monitored gullies and large increases in the volume of some gullies. Improving land condition can reduce runoff and consequently gully erosion rates. Rob and Sue Bennetto of Virginia Park Station for providing access to their land and support with the project. Scott Wilkinson, Anne Henderson, Aaron Hawdon and Rex Keen (CSIRO).